the ability of rocks to be magnetized by the earth’s magnetic field during the rocks’ formation and to retain the magnetization acquired (remanent magnetization) in subsequent epochs. The magnitude and direction of this magnetization conform to the magnetic field that existed at a given point on the earth’s surface when the rock was formed, that is, millions or hundreds of millions of years ago. Paleomagnetism permits scientists to study the geomagnetic field’s evolution, which is “recorded” in the magnetization of rocks. Every rock contains grains of ferromagnetic or ferrimagnetic minerals, such as magnetite, titanomagnetites, hematite, ilmenites, maghemite, and pyrrhotite. In some rocks the content of magnetic grains is only a fraction of a percent; nevertheless, it is precisely these grains that account for the remanent magnetization of the rocks. The conditions of formation determine the acquired magnetism’s intensity and stability, that is, the capability to resist demagnetization effects. Thermoremanent magnetization (TRM), which is acquired as a rock cools in a geomagnetic field from a temperature above the Curie point Θ, is the most important type of remanent magnetization for paleomagnetism. It arises primarily during the cooling of melts, or lavas and intrusions; that is, it is characteristic of igneous rocks. At temperature T ≤ θ, TRM increases at an intense rate. When the cooling reaches the blocking temperature Tb, the increase slows down abruptly and the acquired magnetization is “frozen”—the particles’ magnetization vector becomes incapable of orientation along the field. TRM can be tens or hundreds of times greater than the magnetization that arises in the same field at room temperature. In order to remove TRM, magnetic fields tens or hundreds of times stronger than the field that created the TRM are required. Another type of stable remanent magnetization is chemical remanent magnetization (CRM), which arises during the growth of ferromagnetic grains in a magnetic field. Viscous remanent magnetization (VRM) arises during the prolonged action of a magnetic field on a rock and is a result of thermal activation and diffusion processes. Detrital remanent magnetization (DRM) arises in sedimentary rocks when magnetic grains that already possess TRM or CRM are eroded from crystalline rocks. As the grains settle to the bottoms of rivers or basins of water, they are oriented like a compass needle in the magnetic field. When the sediment consolidates, the particles are cemented into it; they retain their orientation, which accounts for the remanent magnetization of the rock. CRM of sedimentary rocks can occur at the time the rocks are formed or at a later time. In igneous rocks CRM is always secondary; that is, it arises during the lifetime of the rock. VRM is always secondary and so lacks a definite age. Thus, TRM and DRM are connected with the process of rock formation. If the methods of geochronology give us the age of a rock, we thereby know when the rock was magnetized. This knowledge is important for the study of the variation of the geomagnetic field in time. The first step in paleomagnetic investigations is to determine what types of magnetization a given rock has. An effort is made to single out the primary magnetization, which was acquired when the rock was formed; the primary magnetization is the basis for determinations of the ancient geomagnetic field. There exist field and laboratory methods of investigation that permit scientists to determine the original direction of the remanent magnetization vector by statistical analysis of a sufficiently large number of measurements made on individual specimens. The direction of the magnetic meridian is established from the direction of the horizontal component of the vector, and the paleomagnetic latitude Φ is determined from the magnitude of the inclination of the vector at the rock collection site. Systematic paleomagnetic research has been conducted in various countries since the early 1950’s. The main results of the investigations are as follows. (1) Over the last 600 million years the intensity of the geomagnetic field seems to have varied little. 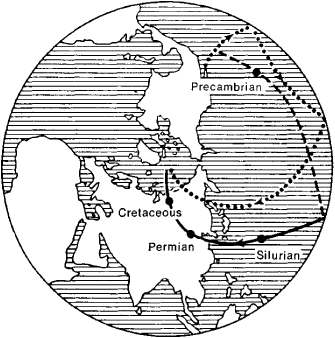 (2) Determinations of the positions of the geomagnetic pole based on rocks from Europe and North Asia show that over the last 500–600 million years the pole has shifted from the central part of the Pacific Ocean (the Cambrian, 570–500 million years ago) through a region located to the northeast of Japan (the Permian, 285–230 million years ago) and through northeast Asia to its present location. The curves of the pole’s movement that have been constructed on the basis of the magnetization of rocks from other continents or tectonic platforms, such as the Indian Platform, differ significantly from the European curve. For example, the pole determined from Permian deposits in Australia was at one time located in Northwest Africa and subsequently moved toward the European curve. Values for paleomagnetic latitude, however, display a high correlation with paleoclimato-logical data. This correlation has permitted scientists to suppose that the magnetic axis has usually coincided with the earth’s axis of rotation or been located near that axis. Figure 1. Paths of the geomagnetic pole according to paleomagnetic data. The path corresponding to the results of investigations of the magnetization of European rocks is indicated by the dotted line; the path corresponding to the magnetization of North American rocks is indicated by the broken and solid lines. the curves is achieved, are extremely close to the reconstructions proposed by geologists in the tectonic hypotheses of mobilism— hypotheses based on the similarity of the contours of the continental slope and the geological structure of the separated parts of the ancient Paleozoic continents, such as Africa and South America. If continental drift is rejected, the law used by investigators of paleomagnetism to determine the position of the geomagnetic pole in past geological epochs is invalid and the field must be assumed not to have been dipole in those epochs. Although the data of a number of investigations support the hypothesis of a dipole field, an unambiguous answer to this question has not yet been obtained. Figure 2. 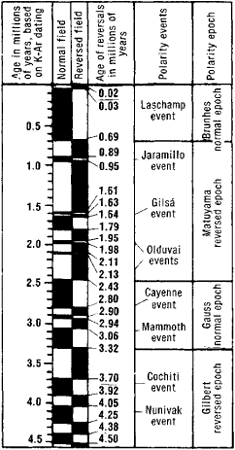 Absolute paleomagnetic geochronological scale for the last 4.5 million years. The names of the polarity events, or brief periods of changed polarity, derive from the geographic names of the places where the events were discovered. The polarity epochs are named in honor of scientists who made important contributions to the study of terrestrial magnetism. (4) Given the same direction of the geomagnetic axis over time intervals ranging from 500,000 to 50 million years, the geomagnetic field changes direction; reversals of the geomagnetic field occur. In epochs of normal polarity the south magnetic pole is located near the north geographic pole, and in epochs of reversed polarity it is near the south geographic pole. The study of reversals has provided an experimental basis for a theory of the geomagnetic field and has permitted the construction of a magnetic-stratigraphic geochronological scale. The chronology of geomagnetic reversals is well established only for the Late Cenozoic (the Pliocene and Quaternary) and a few other periods of geological time (Figure 2). The times of the reversals are imprinted in geologic sections all over the earth and permit the correlation of sections that are distant from each other. Reversals can cause changes in the direction of magnetization of rocks; these changes are made use of to distinguish strata of sedimentary or volcanic rocks and to refine the dating of such rocks and the sequence of geologic events. Kharmov, A. N., and L. E. Sholpo. Paleomagnetizm. Leningrad, 1967. Creer, K. M. “A Review of Palaeomagnetism.” Earth Science Reviews, 1970, vol. 6, no. 6. Blue arrows represent stress direction interpreted by paleomagnetism. Tectonic and paleogeographic interpretation of the paleomagnetism of Variscan and pre-Variscan formations of the Bohemian Massif, with special reference to the Barrandian terrane. offers a description of the paleomagnetism of sediments and sedimentary rocks, how they are magnetized, and how the physical and chemical causal processes may influence the accuracy of paleomagnetism. Paleomagnetism and potassiumargon age of the Messejana dyke (Portugal and Spain): angular limitation to the rotation of the Iberian Peninsula since the middle Jurassic. Late Tertiary to late Quaternary record in the Mackenzie Mountains, Northwest Territories, Canada: Stratigraphy, paleosols, paleomagnetism and chlorine-36. 2001, Fabric, paleomagnetism, and interpretation of pre-Illinoian diamictons and paleosols on Cloudy Ridge and Milk River Ridge, Alberta and Montana: Geographie Physique et Quaternaire, v.
In the new study, Garrick-Bethell and colleagues built on paleomagnetism with another technique of studying moon rocks: Looking at their heat-or thermal-histories. Symons DTA, Cioppa MT (2000) Crossover Plots: a useful method for plotting SIRM data in paleomagnetism. 2007 The study of Earth's magnetism (1269-1950): a foundation by Peregrinus and subsequent development of Geomagnetism and Paleomagnetism. I take it that Kaiser's conflation is a result of his narrow focus on his case studies in paleomagnetism. Stratigraphy and paleomagnetism of the upper middle Eocene to lower Miocene (Uintan to Arikareean) Sespe Formation, Ventura County, California. Studies in paleomagnetism have shown that igneous rocks found all over the world were magnetized in a reversed direction to our present polarity, but with a hundred times greater strength than that which the Earth's field could manage.